Continuing a positive trend, VIA Rail Canada ridership increased by 11.7% in the third quarter of 2017, compared to the same period in 2016, while revenues increased by 13.9%. With more travellers aboard, a total of 296 million miles were journeyed on its trains all across the country over the quarter, up 15% from 2016. 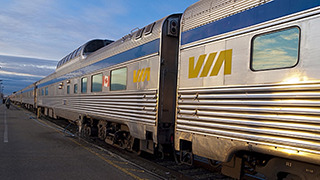 "As Canada's 150th anniversary year draws to a close, I am happy to report another successful quarter at VIA Rail, worthy of its own celebration. Over the past three months, we have witnessed several impressive achievements, including our 14th consecutive quarter of revenue growth and our 7th consecutive quarter of ridership growth — both increasing by double digits compared to last year,” said President and CEO Yves Desjardins-Siciliano.